A new year often means new eating habits, but your busy schedule might have you reaching for the takeout menu. Stop dialing and put down the phone—you don’t have to order out! My Grilled Chicken Broccoli Stir-Fry locks in all of your favorite takeout flavors and cooks faster than it takes for delivery. By grilling the chicken, we make sure these tasty bites are a lighter option than their deep-fried cousins. Stir-fry doesn’t have to be intimidating, nor do you necessarily need a wok. A typical grill brings this quicker-than-takeout dish to life. Americans have developed a love for “Chinese junk food,” so we decided to lighten up this dish. Grilled food not only has a delicious, smoky taste, but it also cuts back on the amount of oil used throughout the dish. We used a very small amount of olive oil in our recipe for this very reason. So foodies, stay in, kick your feet up, and relax. You can have a yummy meal on the table that’s delicious and better for you. Cook’s Note: When it comes to stir-frying, the heat has to be high. And, since there’s very little actual cooking time, it’s crucial to have all your ingredients assembled beforehand. Keep everything separated in bowls based on how much time they need to be in your wok. Chopping your onions, meat, and peppers into similar size pieces will ensure a more uniform cooking time. You can also try substituting brown rice for white rice. This small change can make the recipe an even smarter alternative. Pour the Italian dressing into a zip-top plastic bag and add the chicken. Marinate for 2–3 hours in the refrigerator. Preheat a barbecue or indoor grill to high. Brush a grill basket (or grill pan) with olive oil. Remove the chicken from the marinade and place it in the grill basket. 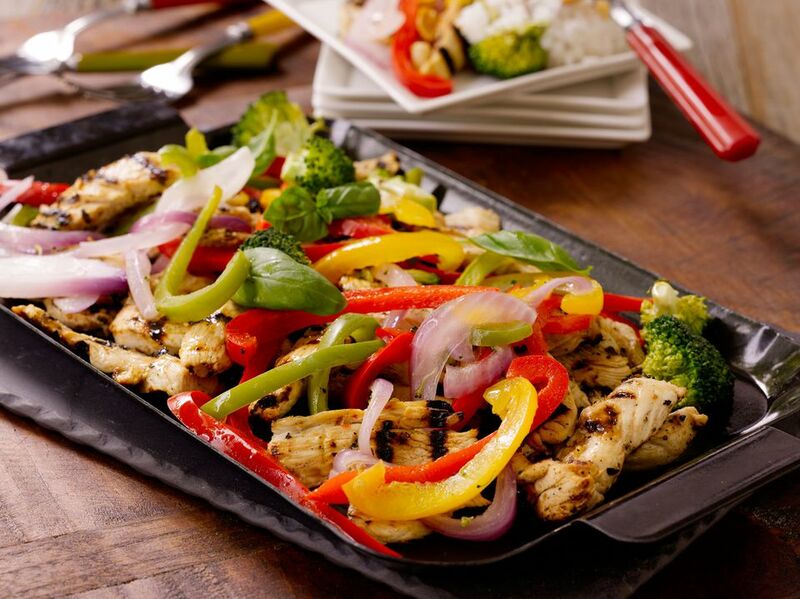 Add the broccoli, red pepper, green pepper, yellow pepper, and red onion to the basket and cook for 2–4 minutes. Flavor with the seasonings and salt and pepper, to taste. Serve over the rice and garnish with fresh basil and chopped cashews or peanuts, if desired.